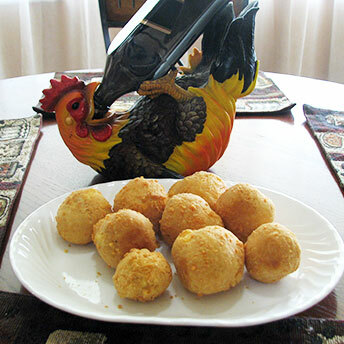 Cheese balls are appetizer balls made using Jong Dutch cheese or best known as Gouda Cheese in the USA. This is a popular item served at parties or get together on the islands of Curacao, Aruba and Bonaire. These are simple to make and are very delicious. Enjoy ! 1 lb of dutch or gouda cheese. Matured (belegen) is prefered. Now slowly add the flour until the content have the consistancy to be able to make balls. With some flour on your hands, make balls out of the content in the bowl .